a The Paris Fashion Week Fall 2013 is the final stop in the raw of the New York, London and Milan fashion weeks. The city that is considered to be one of the key fashion capitals in the world has been always associated with the chic, elegance and sophistication that go along with the relaxed approach to the fashion. Let’s take a look at the street looks that were spotted during the distinct Paris Fashion Week shows. Olga Sorokina, designer, picked the garments of own design. She complemented the look with the Celine hat. As always Ulyana Sergeenko, designer, doesn’t stop surprising us with unique looks: this time she went for the Christian Dior couture dress, which was accessorized with an original hat and platform pumps. Vika Gazinskaya, designer, also opted for the outfit of her own design. Eleonora Carisi, fashion blogger, teamed the jacket and shoes by Frankie Morello, which she styled with the Tory Burch handbag and Roberto Cavalli jewellery. 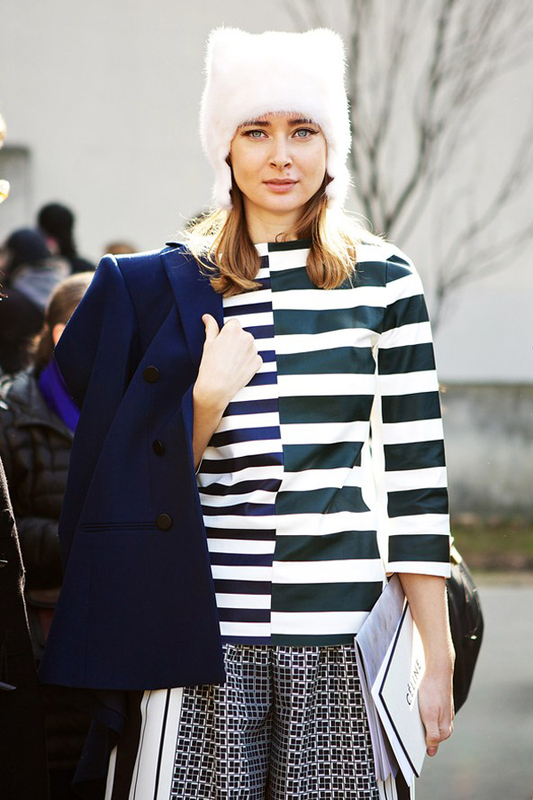 Catherine Baba, went for the coat by Tsumori Chisato, which she complemented with a vintage hat. Kim Ellery, designer, looked stylish in the total black outfit which consisted of the Ellery jacket, shirt and pants layered with the beige fur gilet. She accessorized the look with the Celine bag and Maison Martin Margiela boots. Natalie Joos was not afraid of combining the distinct patterns by coupling the Stella McCartney jumpsuit with leopard print with the black and green polka dot coat. She styled the look with Lian Fahy shoes and Corto Moltedo bag. 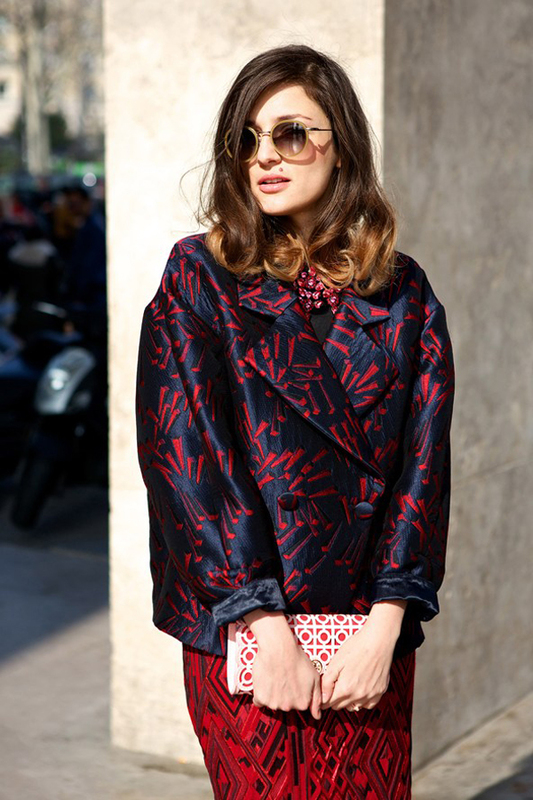 Anne Catherine Frey layered the Sonia Rykiel shorts and jacket with the Kenzo jumper. As for the accessories, she picked the Comme des Garçons wallet. Anita He created an original look by combining the Comme des Garçons puffy jacket, COS cropped trousers and a vintage hat. 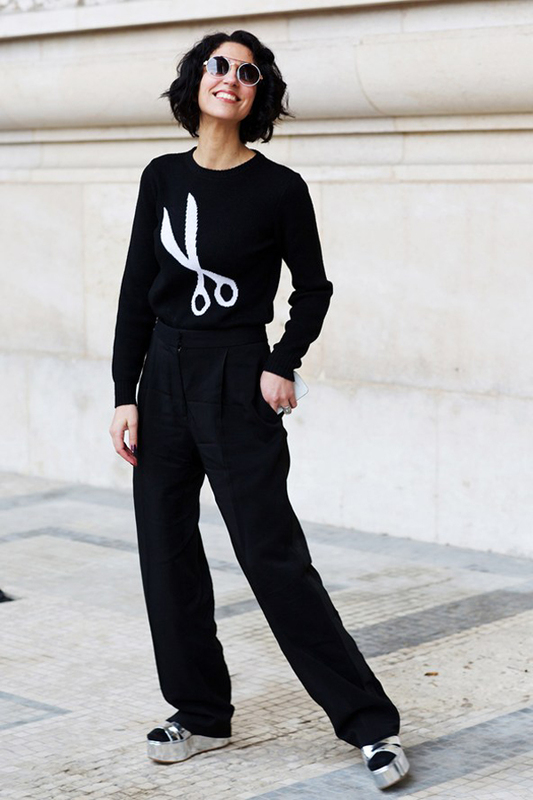 Yasmin Sewell styled her JW Anderson outfit in black color with the silver strappy platform sandals worn over the black sock. 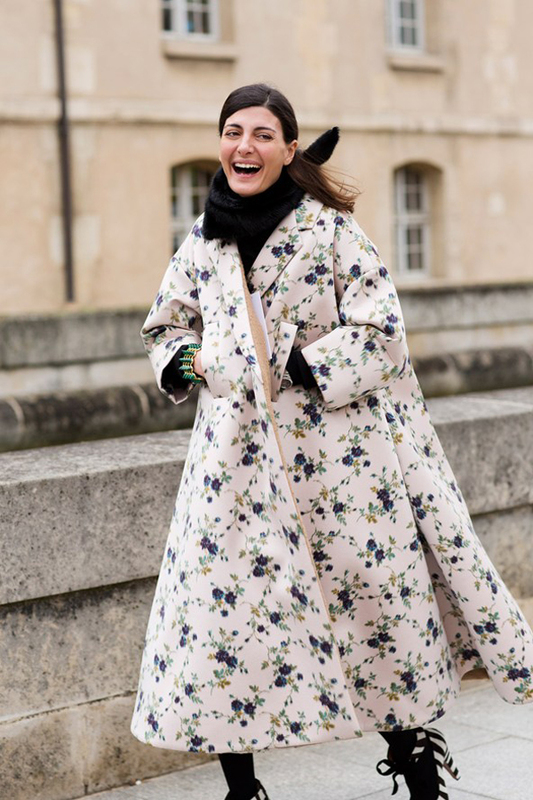 Caroline Issa, editor, coupled the Louis Vuitton skinny trousers with a matching Hockley London printed coat. Fei Fei Sun, model, went for the Marni coat, Dries Van Noten trousers and Prada shirt, which she styled with a Givenchy bag. Leaf Greener, looked chic wearing the Balenciaga puffy jumper, patent leather skirt and vintage ankle boots.